Buick Regal: What Will You See after an Airbag Inflates? 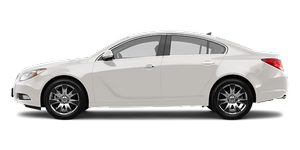 Buick Regal / Buick Regal Owners Manual / Seats and Restraints / Airbag System / What Will You See after an Airbag Inflates? After the frontal airbags and seat-mounted side impact airbags inflate, they quickly deflate, so quickly that some people may not even realize an airbag inflated. Roof-rail airbags may still be at least partially inflated for some time after they deploy. Some components of the airbag module may be hot for several minutes. For location of the airbag modules, see What Makes an Airbag Inflate? . When an airbag inflates, there may be dust in the air. This dust could cause breathing problems for people with a history of asthma or other breathing trouble. The vehicle has a feature that may automatically unlock the doors, turn on the interior lamps, turn on the hazard warning flashers, and shut off the fuel system after the airbags inflate. You can lock the doors, turn off the interior lamps, and turn off the hazard warning flashers by using the controls for those features. Additional windshield breakage may also occur from the right front passenger airbag. ► Airbags are designed to inflate only once. After an airbag inflates, you will need some new parts for the airbag system. If you do not get them, the airbag system will not be there to help protect you in another crash. A new system will include airbag modules and possibly other parts. The service manual for your vehicle covers the need to replace other parts. ► The vehicle has a crash sensing and diagnostic module which records information after a crash. See Vehicle Data Recording and Privacy and Event Data Recorders . ► Let only qualified technicians work on the airbag systems.